What’s She Talkin’ ‘Bout NOW? I’m talking about a little worked (or intentionally, anyway) muscle group called your rhomboids. They’re located just below the much more popular “traps” or trapezius. The rhomboids associated with the scapula (shoulder blade) and are mainly responsible for its retraction. 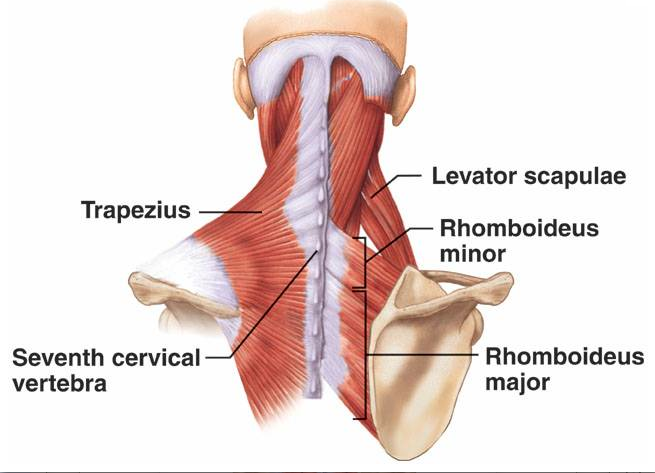 There are two rhomboid muscles: the larger Rhomboideus Major and Minor. Here are a couple of exercises you can do to help strengthen your ‘boids and get you standing tall! Shoulder Blade Squeeze: Begin this exercise standing or sitting with your back straight. Your chin should be tucked in slightly and your shoulders should be back slightly. Slowly tighten your rhomboids by squeezing your shoulder blades together as hard and far as possible provided the exercise is pain free (figure 2). Hold for 5 seconds and repeat 10 times. Resistance Band Pull Backs: Begin this exercise in standing or kneeling with your back straight and holding a resistance band with arms outstretched in both hands. Slowly pull your arms backwards, tightening your rhomboids by squeezing your shoulder blades together as shown. Hold for 2 seconds and then slowly return to the starting position. Perform 3 sets of 10 repetitions provided the exercise is pain free. This entry was posted in FIERCE HEALTH, FIERCE WORKOUTS and tagged health, rhomboids, wellness, workouts by GETFIERCE TRAINING. Bookmark the permalink.